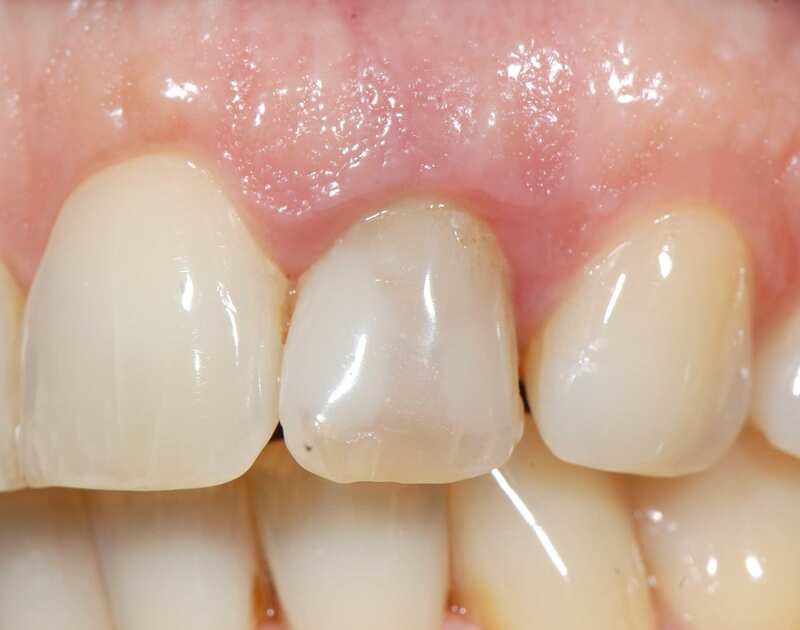 A 53-year-old woman with good overall health presented at the clinic with the chief complaint that tooth #22 (FDI) / #10 (US), which was endodontically treated and discolored, was esthetically unpleasing. 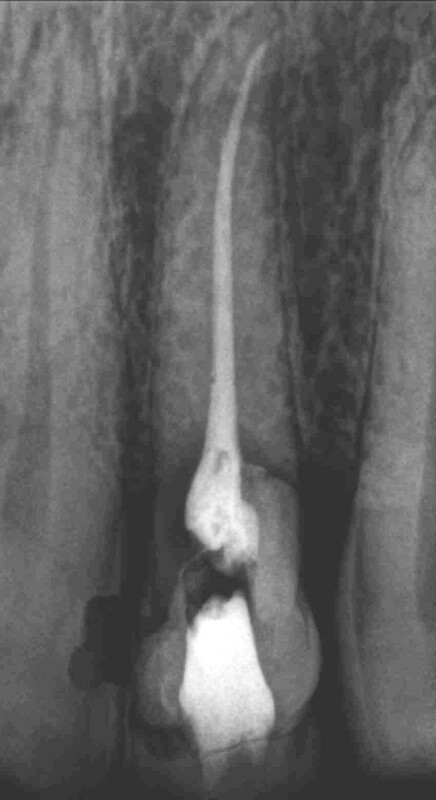 The tooth was hopeless due to root fracture. 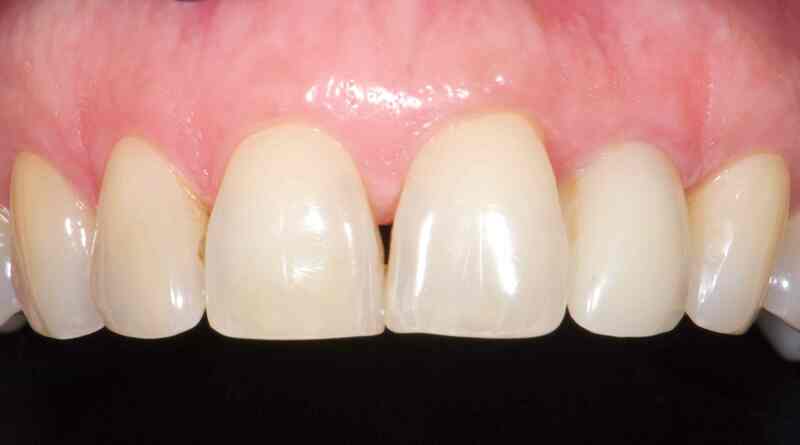 A treatment plan was formulated to replace the non-vital tooth with an implant. 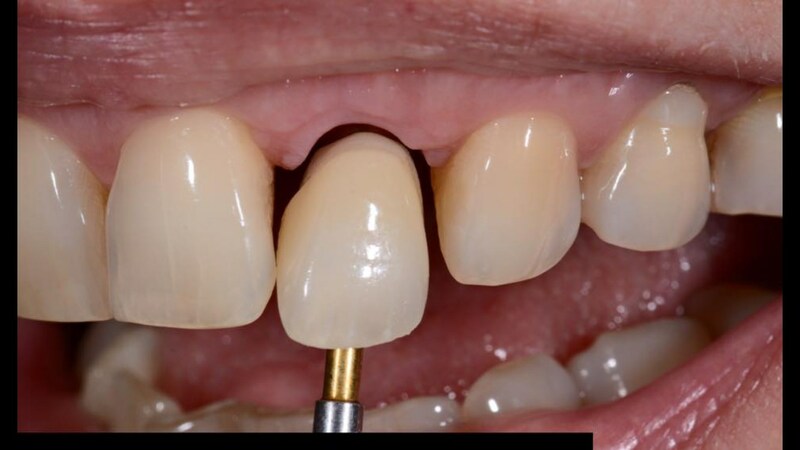 First, the upper left lateral incisor was extracted and a socket preservation was conducted. The site was provisionalized with a Maryland bridge on the same day of treatment. Five months later, the 3D CT Scan revealed insuficient bone volume for implant placement; therefore, a guided bone regeneration procedure was planned simultaneous to implant placement. 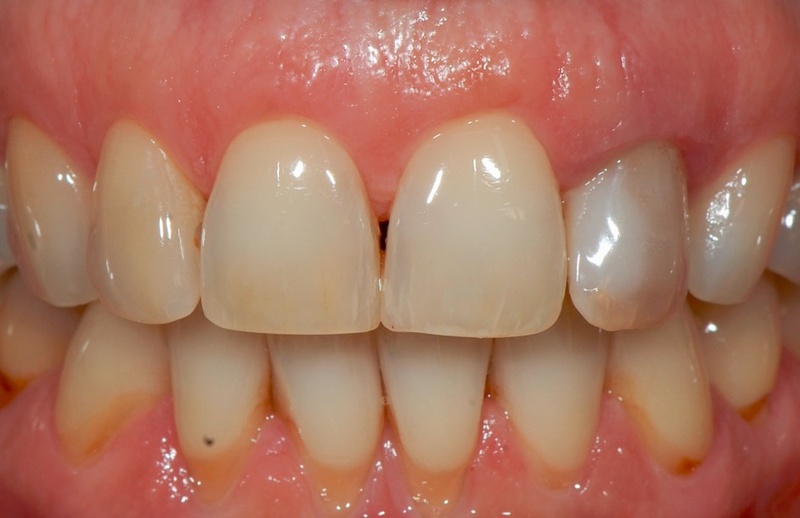 Six months after healing, an implant impression was taken and a screw-retained temporary crown was installed. The following 6 months, the patient came in monthly for recall visits in order to improve soft tissue support and emergence profile. Finally, a screw-retained zirconia crown was installed. Surgical and prosthetic procedures were carried out with no complications. 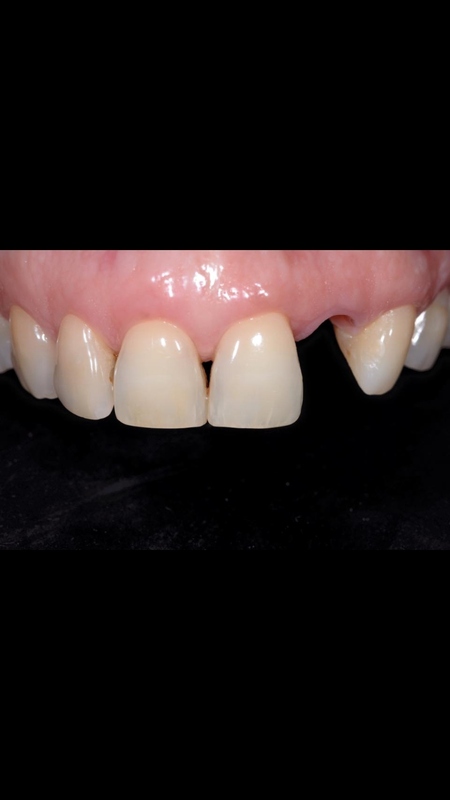 At the three year follow-up visit, the patient was very pleased with the final aesthetic and functional result. Intra-oral frontal photograph. Note the discoloration of tooth #22 (FDI) / #10 (US). Intra-oral lateral photograph (close-up). Note the discoloration of tooth #22 (FDI) / #10 (US). 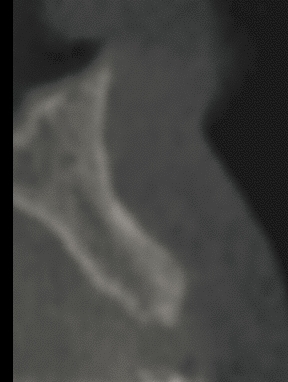 Initial periapical x-ray of tooth #22 (FDI) / #10 (US) which had been root-canal treated previously. Note the cervical root fracture. Tooth #22 (FDI) / #10 (US) was extracted and the socket was preserved by means of anorganic bovine bone. 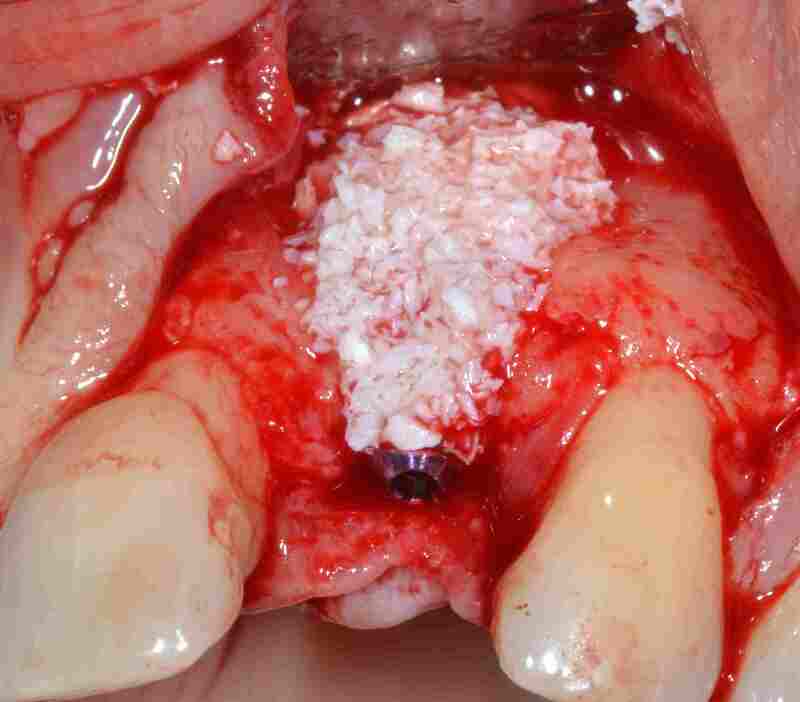 Socket closure was achieved by means of a connective tissue graft. 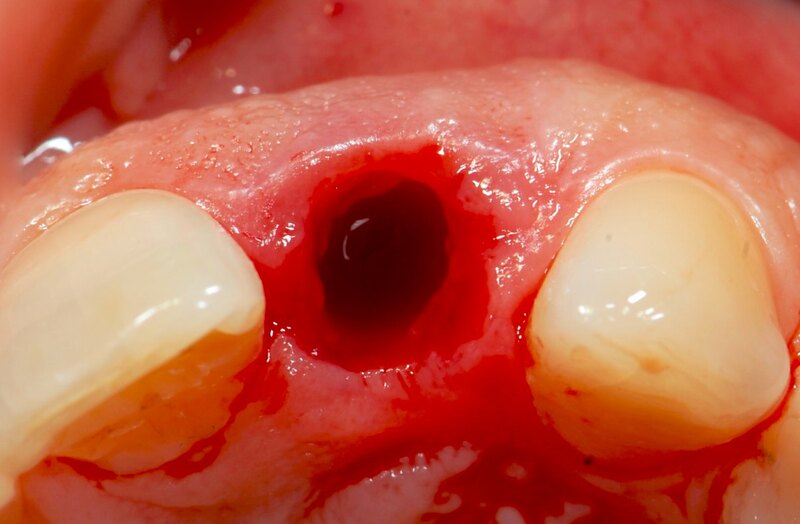 Socket preservation can help reduce bone loss after a tooth extraction and enable the safe placement of a dental implant. 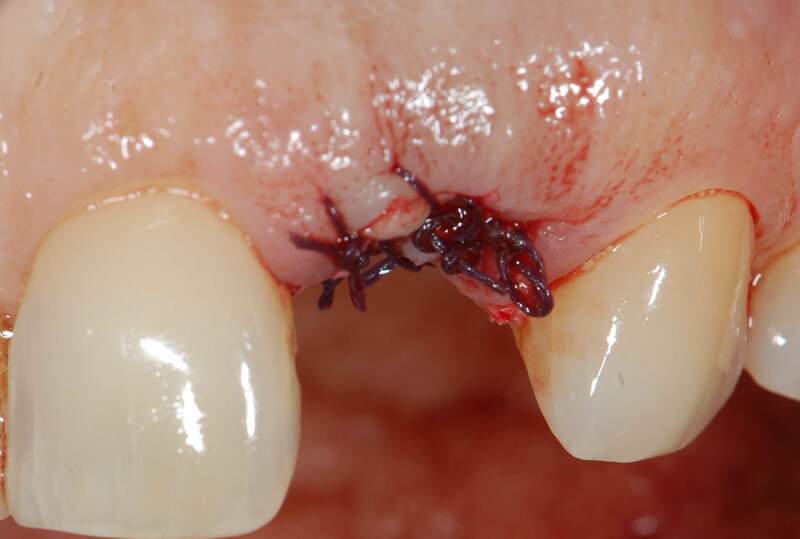 Sutured site after extraction of tooth #22 (FDI) / #10 (US) and site preservation. An immediate Maryland bridge was delivered on the day of surgery. Five months after extraction, a CBCT scan of the site was performed. This revealed insufficient bone volume for implant insertion. Insufficient horizontal and/or vertical bone volume at an implant site may cause aesthetic and functional complications around implants. It is advisable to address this bone deficiency previous to or at implant placement, for example, by means of guided bone regeneration (GBR). 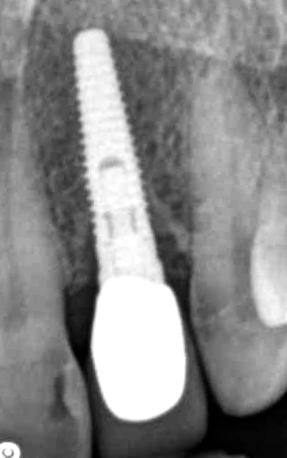 A horizontal GBR procedure was planned simultaneous to implant placement. 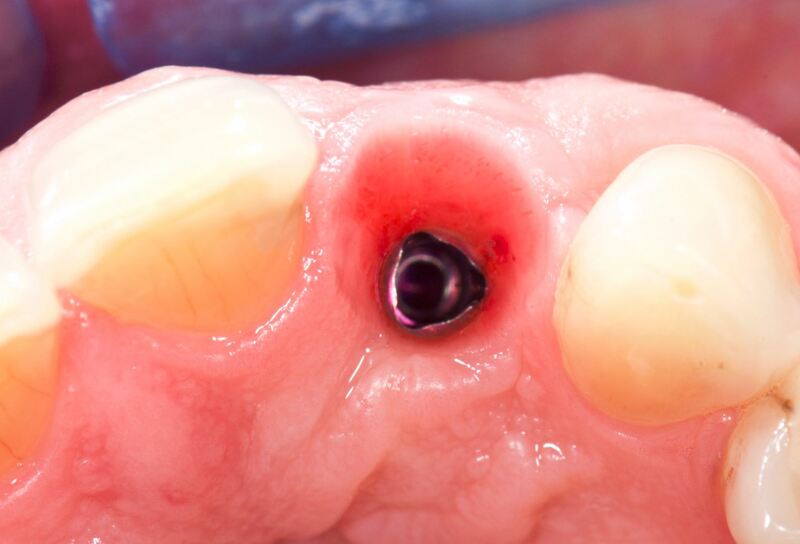 A narrow platform NobelReplace® Conical Connection implant was placed. Note the initial buccal plate fenestration. 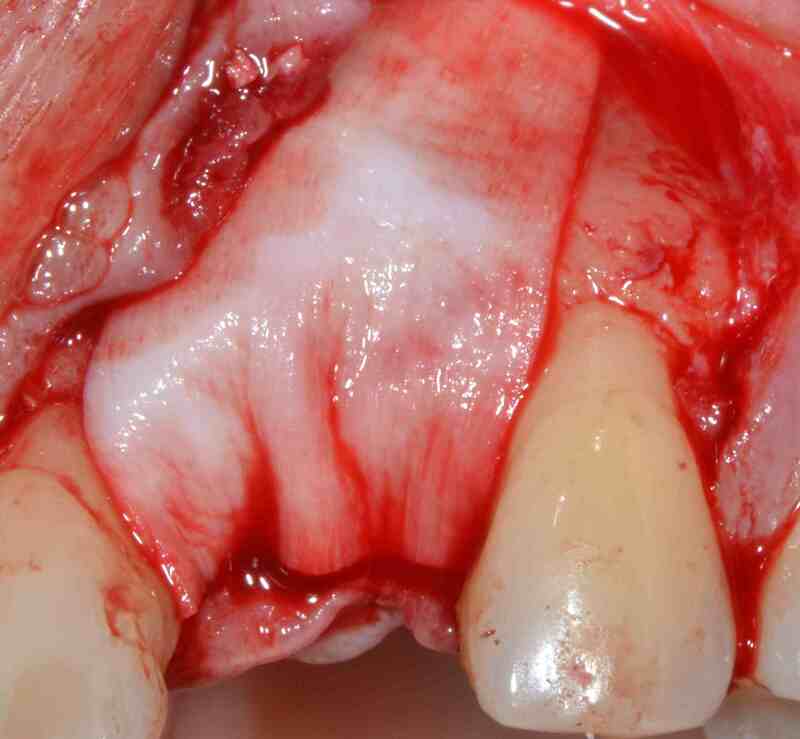 A bone regeneration procedure was performed using 2 mm of autologous bone chips on exposed implant threads and 2 mm of inorganic bovine bone on the buccal and crestal aspects of the site. The bone graft was covered with a collagen membrane. Occlusal view after site suturing. 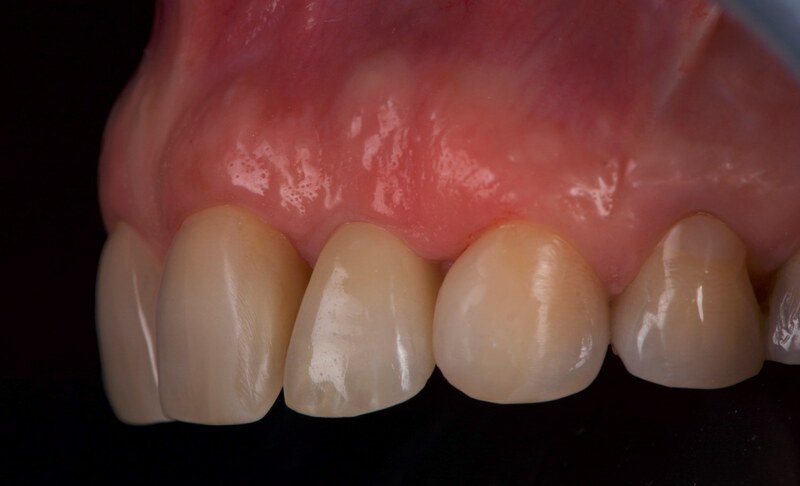 Intra-oral frontal view of the screw-retained acrylic-resin temporary crown after one month of healing. 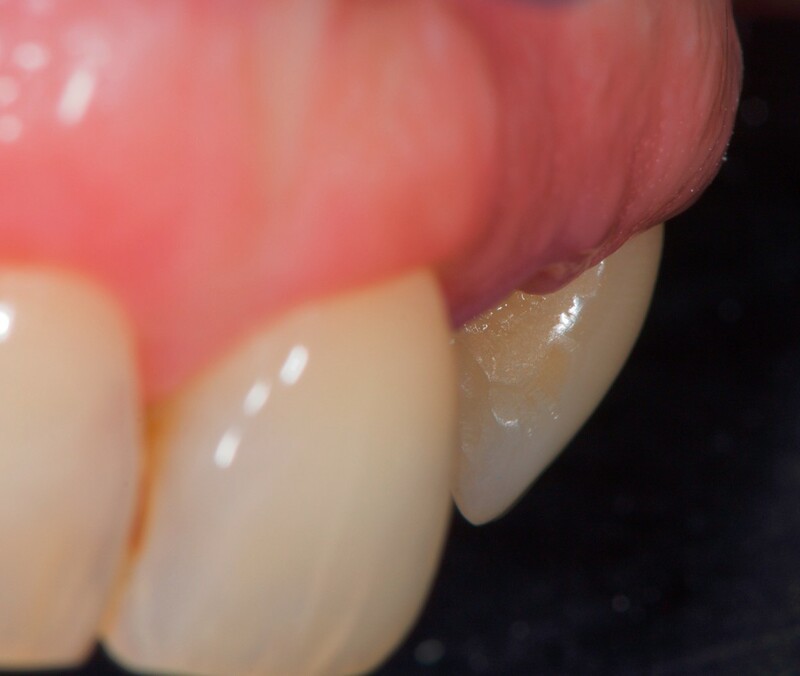 After 6 months of healing, the temporary crown was removed and an implant-level impression was taken. Intra-oral frontal photograph at the time of final impression. Intra-oral photograph at the time of final impression. 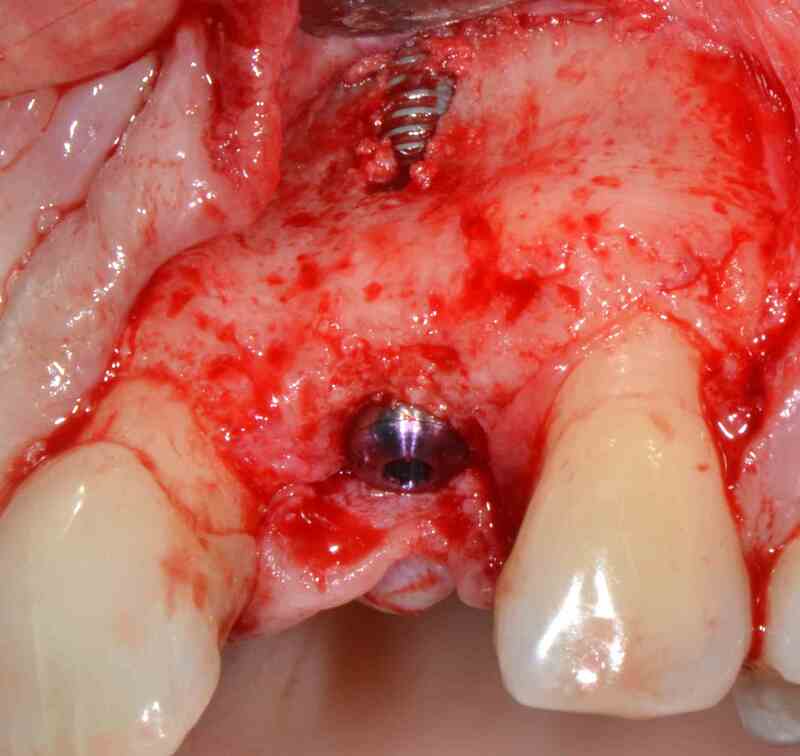 Note the horizontal volume at the implant site. 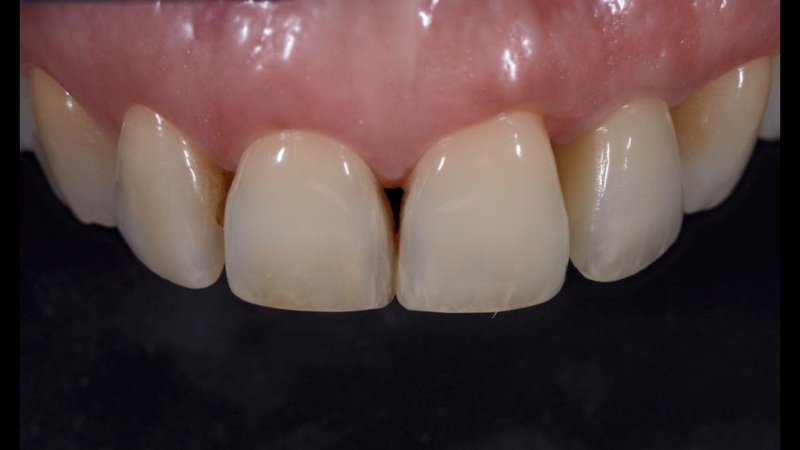 A screw-retained final zirconia crown was delivered. A screw-retained final zirconia crown was delivered. Note the harmony of the white and pink aesthetics. Extra-oral frontal post-treatment view, 3 years after treatment completion. Intra-oral frontal photograph 3 years post-treatment. Note the stability of the soft tissues after the bone regenerative procedure. 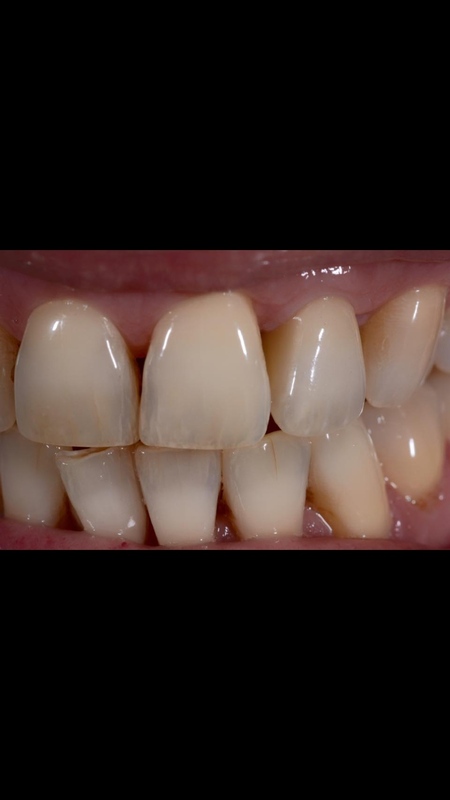 Intra-oral photograph 3 years post-treatment. Tissues around the implant were stable. Periapical x-ray 3 years post-treatment.